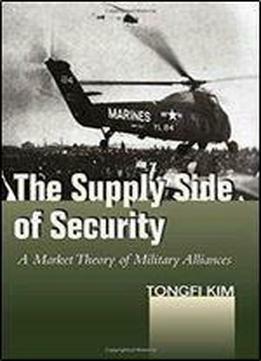 The Supply Side of Security conceptualizes military alliances as contracts for exchanging goods and services. At the international level, the market for these contracts is shaped by how many countries can supply security. Tongfi Kim identifies the supply of policy concessions and military commitments as the main factors that explain the bargaining power of a state in a potential or existing alliance. Additionally, three variables of a state's domestic politics significantly affect its negotiating power: whether there is strong domestic opposition to the alliance, whether the state's leader is pro-alliance, and whether that leader is vulnerable. Kim then looks beyond existing alliance literature, which focuses on threats, to produce a deductive theory based on analysis of how the global power structure and domestic politics affect alliances. As China becomes stronger and the U.S. military budget shrinks, The Supply Side of Security shows that these countries should be understood not just as competing threats, but as competing security suppliers.